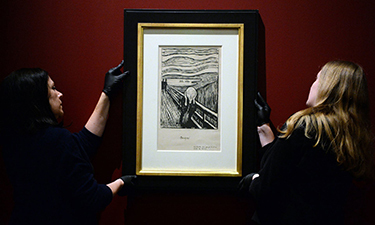 Andrew Dickson, in the Guardian, describes the complexities of loaning, packing, shipping, uncrating, and displaying important works of art. Even if you are an obsessive gallery-goer, it’s possible you haven’t put much thought into how the works on the wall came to be there. The art world prefers it this way: what happens behind the signs reading “No Entry: Installation in Progress” remains a ferociously guarded secret. The only hint that this Song dynasty bronze has arrived from that private collection in Taiwan, for example, is a discreet credit on the wall. It may be that, absorbed in our face-to-face encounter with the artwork – what Walter Benjamin described as its “aura” – many of us prefer not to gaze too deeply into that mystery. Yet the mechanisms required to get that bronze from Taipei to St Ives – loan agreements, insurance, packing, couriering, shipping, handling, installation – are delicate, expensive and complex. Behind every exhibition is an intricate logistical web that reaches across the globe. Institutions are under huge pressure to share collections, both in the UK and internationally. Missed Frida Kahlo at the V&A? It has recently opened at Brooklyn Museum, just as the Metropolitan Museum’s 2017 exhibition of early Diane Arbus has come to London. The British Museum’s A History of the World in 100 Objects is shortly to arrive in Hong Kong, by way of Abu Dhabi, Taiwan, Japan, Australia and China. It has been on the road since 2016. Many museums now rely on blockbuster exhibitions to drive visitor numbers; often, the only way of paying for these is to partner with another institution and send the show on tour. The demands of creating large shows populated with star loans, and the logistics required to make them come together, are intense. “It has become a sort of arms race,” said one curator I spoke to, with a trace of a sigh. A hyperactive art market creates a momentum all its own. According to the most recent analysis, global art sales total nearly $68bn (£52bn) annually, a 10% increase since 2008, with some 40m transactions made last year alone. Vast quantities of art are continually being shifted from auction houses to purchasers to dealers and back again, especially in the fast-expanding Asian markets. Two decades ago, there were around 55 major commercial art fairs; now, there are more than 260. The end result is that more art than ever, worth more money than ever, is travelling more than ever. Fine-art shipping is expensive, specialised and technically challenging work. Old masters are fragile, but some contemporary sculptures are so friable – or so poorly fabricated – that moving them anywhere is a major risk. And there is the added pressure of handling artefacts that are almost immeasurably culturally important. What exactly do mummies from Ancient Egypt, Chile, Peru, deceased Hungarians, and the body of a dog discovered in a peat bog in Germany have in common? Not much, beyond being dead and provoking in the living a morbid fascination on the basis of inevitable “as I am now, so you shall be” reflections. There are 150 objects on display, most on loan from German museums. They include not just the expected relics of ancient Egypt, but also unexpected relics of that time and place: mummies of a falcon, an ibis, a crocodile; a mummified foot separated from its companion limbs during an era when mummies were plundered for their parts; a startling Egyptian head from the Roman era, half wrapped in embalmer’s linen.The sensations accumulate, for displayed here too are far less well-known mummies of South America, where, over thousands of years, multiple cultures honed embalming techniques, from the ancient Chinchorros in Peru to the 13th-century Chiu-chiu in Chile, leading up to the Incas, with their human sacrifices and death celebrations. And here, too, are the members of a single family from 18th-century Hungary, the ill-fated Orlovitses, who perished when tuberculosis ravaged the small town of Vac. Their bodies were rediscovered in 1994, naturally mummified, their paper-thin skin pocked with small holes left by stray bugs in a forgotten church crypt. Hat tip to Fred Lapides. Serial killers have become enormously successful entertainment themes in popular fiction, films, and even an HBO series. These days, the FBI is operating a museum featuring the letters, art and artifacts associated with serial killers, called the Evil Minds Museum. It is discussed in this FBI Podcast by the FBI Behavioral Sciences Unit. Unfortunately, the museum is not open to the public and is only intended to be used by criminal investigators, intelligence professionals, and academic researchers. Dr. Lecter could get in, but not you. the Archives of Never Yet Melted in the 'Museums' Category.